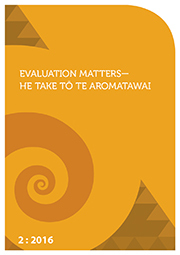 Developing evaluation capacity with non-government organisations (NGOs) in New Zealand is in vogue, with funders increasingly keen to demonstrate that their investments in social-service programmes are outcomes-focused and providers keen to demonstrate the difference they are making. This article presents a case study of how a large philanthropic trust, focused on family social health and wellbeing, engaged with their grant recipients to improve both outcome-focused evaluation practices and their own evaluation of grants. Partnering with a community funding broker and a research company, the Trust enabled an evaluation capacity-building programme, Dancing with Data. This programme was conducted as three distinct workshops several months apart, with 34 grant recipients ranging from small to large NGOs. Through this initiative, these agencies have developed an evaluation framework focused on the value and cumulative impact of funded projects. An evaluation of this programme with participants and key stakeholders highlighted the challenges and benefits of such a collaborative approach to developing the skills and knowledge needed to commission or undertake effective outcome-focused evaluations.